Many funeral directors have visited ASD’s headquarters in the past to meet our staff and tour our facility. This is one of the most rewarding occasions we experience as a company. In addition to demonstrating our state-of-the-art data center, backup generators and sophisticated computer systems, this visit provides us with an opportunity to introduce clients to our staff who they have been speaking with for years. At ASD, 50 of our employees have worked here for 7 years or longer! So when clients meet our staff, they often recognize a name or a voice they have heard many times on the phone. Walking in to ASD’s Operations Center, it is obvious that our company is much more than a Call Center. We are truly a family. The strong rapport and enduring friendships between our employees is supported by ASD’s company culture. By offering a competitive salary, special incentives and incremental rewards, we have been successful in retaining quality employees whose experience sets us apart from others in our industry. Most call centers are a revolving door of new hires, but ASD has refined our staff’s expertise by fostering a positive work environment. every major holiday including Easter, Christmas Eve and New Years Eve, ASD pays our staff triple their regular rate. This increased rate for our staff does not result in additional expenses for clients. Funeral directors are never charged extra for using our service on a holiday. 8-hour Shift Limit – Sitting for an extended period of time can lead to exhaustion, stiffness and other health issues. To prevent staff burn out, ASD prohibits scheduled shifts that are longer than 8 hours, especially on 3rd shift. Attendance Rewards – ASD provides bonuses to Call Specialists for every 25 consecutive shifts worked without absence or lateness. Our track record of answering 90% of all calls on the first ring and 98% of all calls by the 4th ring is supported by this policy. Matching 401k – ASD provides employee 401k contributions. We provide this benefit to everyone including those working part-time to encourage our employees to think of ASD as a place for a career, not just a job. Heath Insurance – While many companies have recently started eliminating employee health benefits, ASD continues to offer multiple plan options as well as dental, vision and disability. We make it easy for our staff to access the health coverage they need. Paid Time Off – Employees at ASD accrue vacation, sick and personal time. Additionally, our system allows employees to switch hours with one another when needed, providing added flexibility. ASD Brings the Gym to You- ASD designed this unique workplace perk to help our employees stay active at work. Call Specialists use the treadmill and recumbent bike stations to move at a controlled rate while simultaneously answering calls. Studies have found that sitting for hours during the day can lead to stiff and dehydrated muscles making injuries and fractures more common. By staying active during their shifts, employees are less likely to hurt themselves due to idleness. In addition to providing healthful benefits, ASD employees who take advantage of the exercise machines are actually paid more through incremental bonuses and other rewards. ASD will also donate $1000 towards an important cause for every 1000 miles walked or biked on our exercise stations. Tuition Reimbursement – A large number of ASD employees are college students or earned their degrees while working at ASD. Many college students have difficulties finding financial aid for college. By providing tuition reimbursement, ASD has been able to help countless employees achieve their academic goals. Many have used their education and increased skills to move up to higher positions at ASD. Remote Stations – ASD now has more than 50 remote computer stations available to our employees to work from home. These remote stations ensure our employees can continue working during severe weather events. A Call Specialist must be employed with ASD for at least two years before receiving a home computer. Year-End Rewards – To show our appreciation for outstanding work, ASD rewards employees at the end of every year. In addition to a Christmas bonus, Call Specialists also benefit from our “Year of Excellence” bonus. This bonus is given to employees who work an entire year without experiencing any mishandled calls. Recognition of Anniversaries – We value the experience and loyalty of our longtime employees. When one of our staff reaches a milestone anniversary within our company, they receive a special recognition award as well as a monetary reward. Incentives for Bilingual Call Specialists – ASD recognizes Spanish-speaking employees offer a unique skill and should be properly compensated. Bilingual Call Specialists receive special incentives for their important contribution to our company. 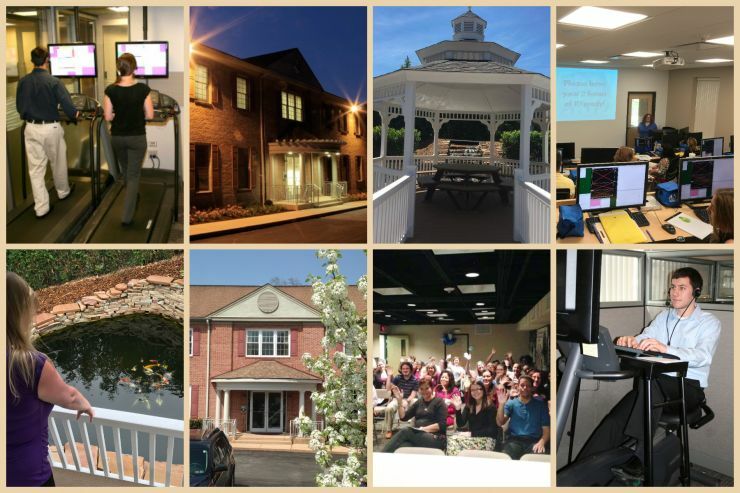 Spacious, Open-Air Facility – Before ASD moved to our current facility in Media, PA, our owners had an opportunity to completely design the layout of the building. It was important to the Czachor family that their employees come to work every day to a welcoming environment. With high ceilings, large windows, ergonomic chairs and many other modern accouterments, ASD’s facility is a comfortable and inviting place for all to work. Our staff also enjoys ASD’s exercise equipment, spacious break room with vending machines and outdoor picnic area. Gazebo Waterfall and Fish Pond - ASD has created a welcoming space for our staff to relax outside before work and during their break. Our "Zen Gazebo Garden" features a waterfall and fish pond filled with colorful koi who our employees take turns feeding. Virtual Corkboard – Call Specialists at ASD utilize wide computer screens. A portion of the screen is dedicated to a Virtual Corkboard window where our staff can add their own personal photos. Employees can view their photos between calls and share them with their co-workers. Mary Kay Ash once said, “People are definitely a company’s greatest asset. It doesn’t make any difference whether the product is cars or cosmetics. A company is only as good as the people it keeps.” ASD fully endorses this philosophy. Fostering a supportive company culture has allowed us to retain experienced and skillful employees that have helped our company to thrive. While the answering service industry offers jobs, ASD offers careers. Those who desire more of a challenge have plenty of opportunities in our growing business. If you would like to learn more about ASD’s Employment opportunities and benefits, please visit the Career page on our site or call 610-744-1200 to take the first step in our hiring process.